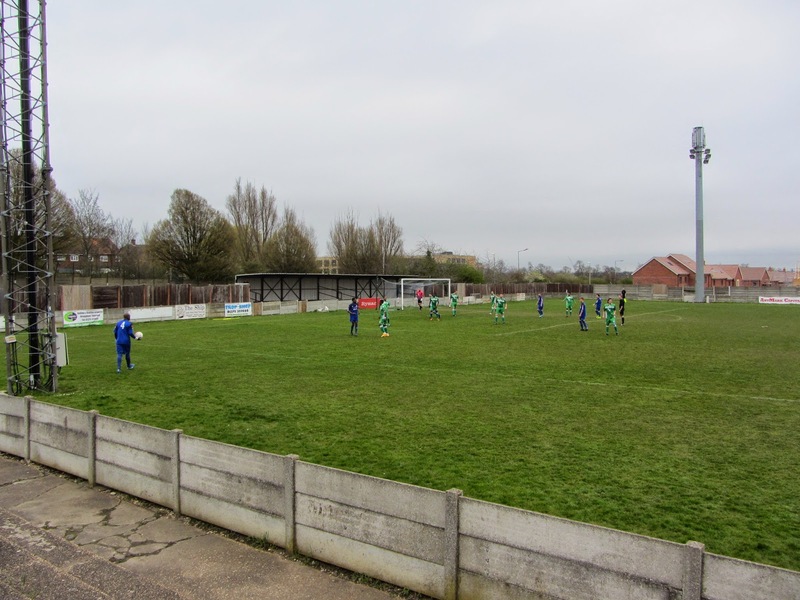 My seventh ground of 2015 was on Monday 6th April at Mill Field in Aveley, Essex. 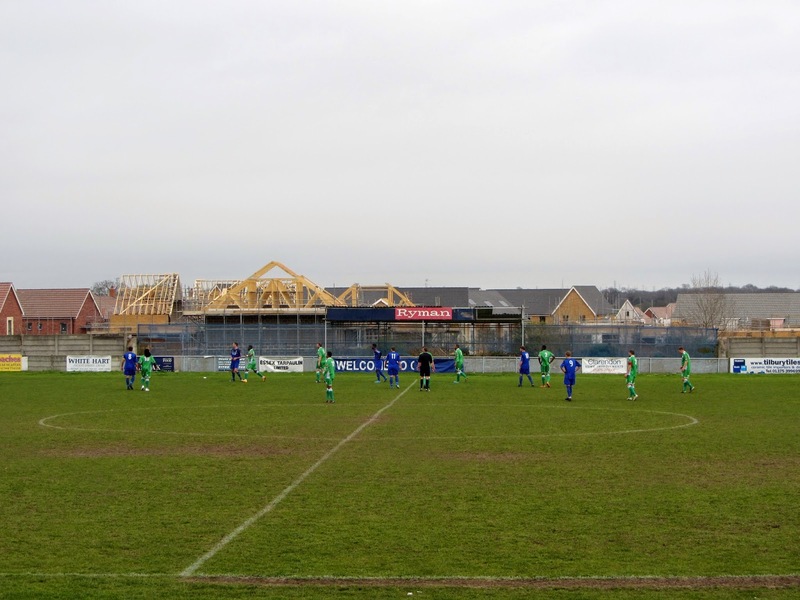 The match was Aveley vs. Thamesmead Town in Isthmian League Division One North. 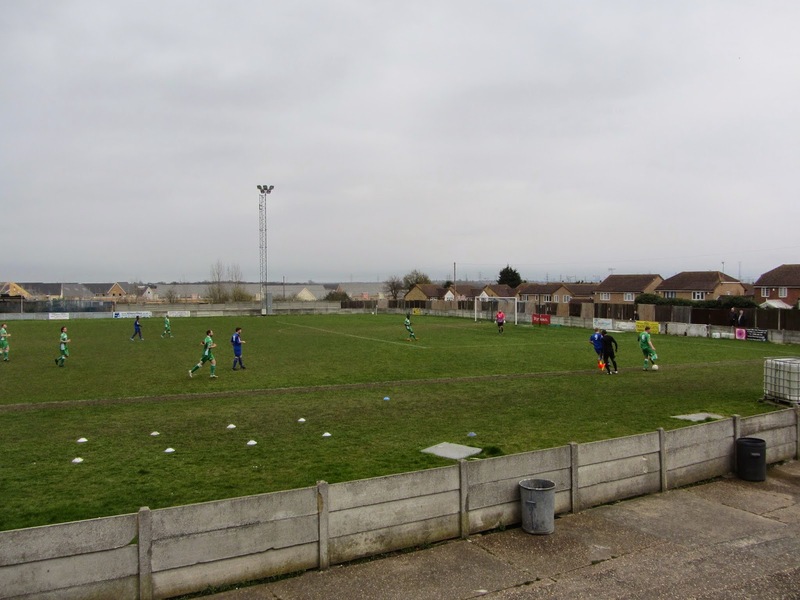 Mill Field was close to the centre of Aveley and just over 2 miles from the nearest railway station at Purfleet. 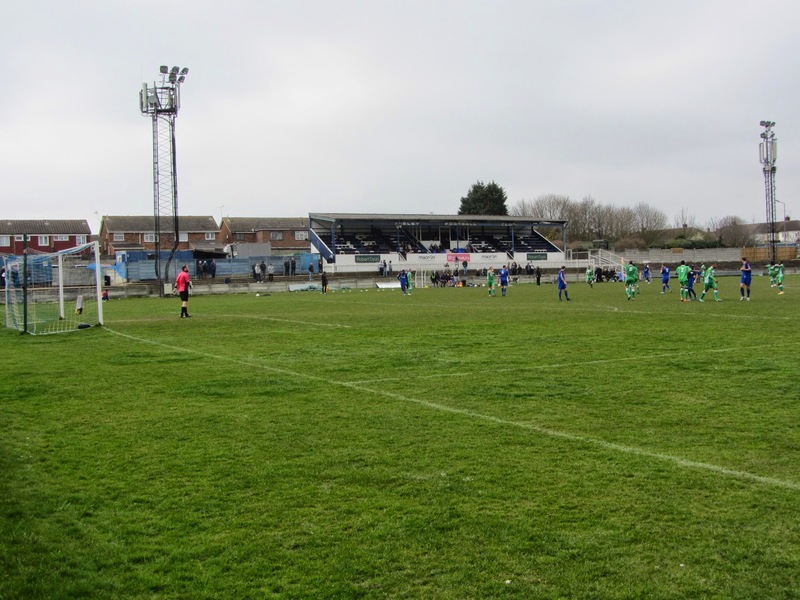 The ground was home to Aveley between 1927 and 2017 when the club moved to a new venue at Parkside to the north of the village. During my visit the ground was bordered by housing on three sides and the demolition of the ground made way for the rest of the site to be converted to housing as well. The west side of the ground was the most significant part of the venue. There was a 400 seat wooden stand level with the half-way line - this structure was built in the 1950s and had a few supporting columns at the front of it to hold up the roof. In front of this was a large amount of uncovered concrete terracing which ran for the length of the pitch. The clubhouse, dressing rooms and dugouts were also on this side of Mill Field. The east side housed the Pepper Stand until it was damaged in a storm in 2009 - when I visited there was just a small bit of covered concrete terracing with a tarpaulin back to it. Because of the curve of the ground this sat a way back from the pitch. Behind the northern goal there was a covered metal terrace which was added in recent years. The rest of the venue was uncovered hard standing. The visitors were on top in the early going though it took until the 28th minute for them to take the lead. Tyrus Gordon-Young played a slick pass in behind the defence which allowed Michael Uwezu time to slide the ball past James Marrable in the Aveley goal. In the 34th minute Thamesmead doubled the lead when a dangerous cross into the area saw Spencer Harrison divert the ball into his own net. It looked like the away side were on for an easy win but in the 41st minute Aveley grabbed a lifeline when Steve Willis beat the offside trap and having drawn the goalkeeper then squared for Liam Nash to stoke into the empty net. Thamesmead restored the two goal lead in the 54th minute in real route 1 fashion - a long goal kick up field was nodded on for Michael Uwezu to slam past the goalie. This lead went back down to a single goal in the 72nd minute as Petrit Elbi held off the attentions of a couple of defenders on the edge of the area before shooting in the bottom corner. This was the catalyst for a costly few minutes for Thamemead - firstly Derek Duncan was sent off for hitting Luke Stanley and straight after this they conceded a third when a nice passing move culminated in Arian Retkoceri curling a shot in off the post from 20 yards out. The hosts were well on top for the rest of the game but couldn't quite get a winner. In the 93rd minute Thamesmead were reduced to nine men as Michael Spencer was given his marching orders for a second booking but there wasn't enough time for Aveley to take advantage of this.